Holds your moldings perfectly in place. Description - Shaw’s Timberline laminate plank flooring is an Anderson inspired visual in a beautiful, causal hickory that features a rustic style accented with cross-sawn marks, worm holes, and swirling heartwood. Light and hand-scraped, these laminate planks are thick helping to create a floor that not only looks like real wood but also “walks” like one. This upscale laminate flooring collection is backed by a 30 year warranty and is very easy to install, meaning less time installing your new floor and more time enjoying it. Resistant to moisture, wear through, staining and fading in direct sunlight, these laminate planks are a perfect addition to any room in your home. So look no further, Shaw’s Timberline laminate planks are the perfect no hassle, no fuss alternative to standard hardwood flooring. Material – Shaw’s laminate flooring is constructed of four layers: The backing, which is reinforced with melamine for structural stability and moisture resistance; The core, OptiCore, which is constructed with recycled wood fiber creating a strong, stable, and moisture-resistant core; The decorative layer which features the highly detailed photograph that gives the laminate the appearance of wood or tile; And lastly, a melamine wear layer reinforced with aluminum oxide creating a tough yet beautiful floor surface that is resistant to staining, fading, surface moisture and wear. Size – Laminate floor planks are 5.43" wide x 50.79" long. Weight – Each laminate plank weighs ~3.94 lbs. Recommended Uses – Shaw Timberline has been designed to be used in residential environments in below, at or above grade applications. This laminate plank floor is perfect for closets, bedrooms, home offices, dining rooms, living rooms, kitchens, basements, bathrooms, dens and much more. For more detailed maintenance and minor repair instructions, please Click Here. For printable detailed installation instructions, please Click Here. Backed by a 30 year warranty. Look and "walks" like real hardwood flooring. Greenguard Children and Schools Certified. 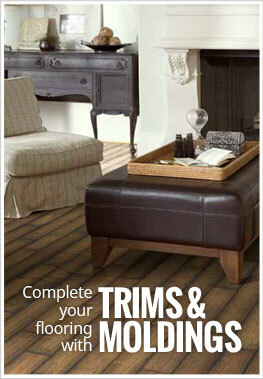 We are so happy with our selection of Shaw Timberline floors in Sawmill Hickory. We put it throughout our entire home. Warm and rustic with so much character. The finish has held up really well over the last year of use. Hopefully this flooring will still be available if we ever get to the point it needs replaced. I would choose it again.